The Orphan Rescue opens with 12-year-old Miriam and her grandfather taking her younger brother David to an orphanage in the late spring of 1937 in Sosnowiec, Poland. Miriam's grandparents have no other choice. The Depression has been a financially trying time for everyone, and when Miriam’s locksmith grandfather injures his hand and can no longer work, the grandparents are faced with a difficult decision. Young Miriam is pulled from school to work as a butcher’s assistant, while David must go and live at an orphanage, headed by the beady-eyed, vulture-like director, Mr. Reznitsky. After already losing her parents, Miriam is devastated to say good-bye to her brother and vows to bring him home, one way or another. The Orphan Rescue offers the pre-teen reader a strong girl character in Miriam, who is true to her word and perseveres until she fulfills her promise, even when it requires her to tell lies and transgress the rules. In the book’s afterword, we learn that this is in fact the true story of Miriam and Alter Chaim, the author’s cousins. Dublin also shares in this section that she wanted today’s children to know that poverty throughout the world still forces families to send their children to orphanages and take them out of school to work. Although this book was intended for pre-teens, I decided to read it to my 8-year-old daughter. She thought that Miriam had done the right thing because she believed that brothers and sisters had an obligation to protect one another; however,“That was a long time ago,” she said. “They don’t have orphanages today.” I told her that these types of institutions didn’t exist in our country but that we still had foster homes. This led to a fairly lengthy conversation about the few alternatives some parents have when they lose their jobs or become ill and have no immediate family to help them out. 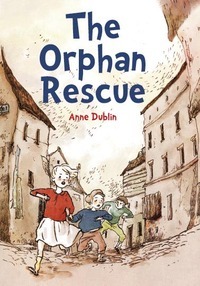 As a former teacher, I can see that The Orphan Rescue would make a good class reader, as the subject matter would hold the interest of strong readers, while the book is easy and short enough to accommodate those with lower reading skills. The book also provides teachers with numerous areas of discussion and starting points to explore other areas, such as European Geography, World Religions, the Depression, Genealogy and Child Labour. Another idea might be to create a second version of this book for stronger or older readers. Its beginning and first few chapters are very dramatic and could have been fleshed out with more period details to hold the attention and draw the reader further into the story. Overall, this was a rich story and all the more compelling because it was true. : Review: The Orphan RescueTweet this!